In the 1960s, a massive change swept across Finland. The Americans had finally perfected their design of a vehicle for recreational use on the snow — the snowmobile. While it has always been seen as a fun toy — sort of like a jet ski — in North America, the Ski-Doo imported by a schoolteacher in 1961 significantly changed the way many people in Finland approached their livelihoods. 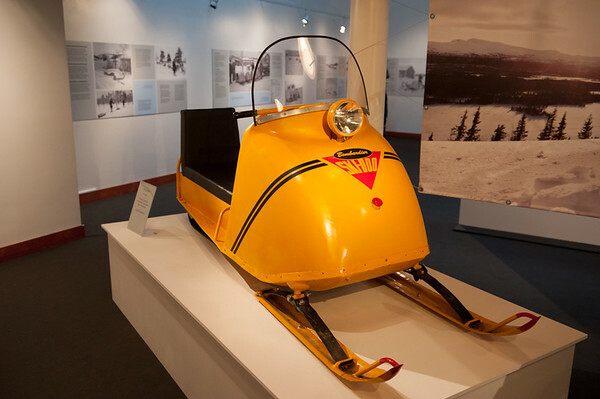 The original model of Ski-Doo to be imported into Finland. This was particularly true for the reindeer herders of Lapland, the Sami. Previously, they had been nomadic, following their herds as they migrated across Lapland. They had two main forms of transport in winter: skis and sleds pulled by reindeer. While they could cover a fair amount of ground each day on these, neither of them could hold a candle to the speed that the Ski-Doo provided. Even though it was a pain to carry around all the spare parts that the unreliable machines may need, their speed and versatility made them worth it. Fifty years later, there are still plenty of reindeer across Lapland that have been trained to pull sleds even though they are no longer the main form of transport. The training process takes 2-3 years of hard work, which starts with introducing the reindeer to the harness and gradually works up to pulling a sled with people in it. Our guide, Päivi, harnessing up Hissu, the lead reindeer. While reindeer are a semi-domesticated animal by nature, it still takes a good eye to pick the reindeer with just the right temperament — and even then you might end up with a reindeer that decides he doesn’t want to run around a track anymore and instead decides to strike out into the wilderness on his own (like I saw happen at the Sami Easter Festival)! 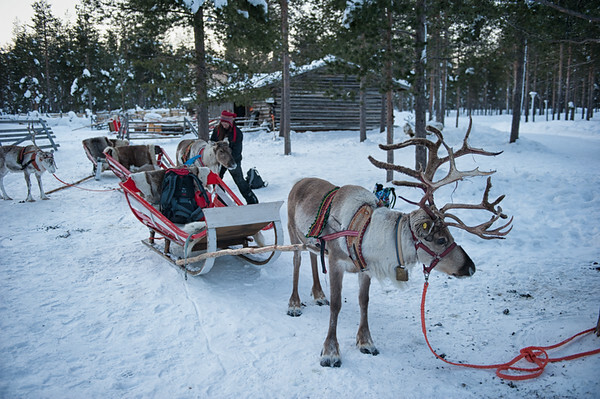 While I got to meet some of these animals firsthand when I visited a reindeer farm in Inari, I was interested in what it would be like to ride behind one through the forest. Other travelers I’d met along the way had told me it was very calm and peaceful, like dogsledding can be when the dogs aren’t haring off after being stopped. The sleds and reindeer nearly ready to go. The reindeer were certainly much calmer when we arrived as Päivi, the guide for my northern lights sled trip at a farm north of Rovaniemi, harnessed them for the trip. There were no bear hugs and there was no howling in anticipation of the upcoming run. 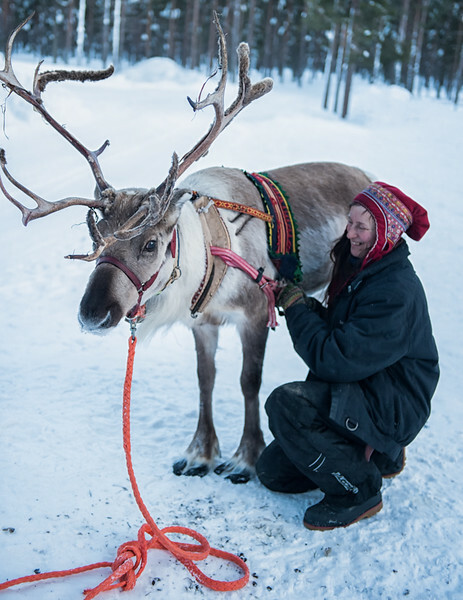 Instead, the three reindeer that would be pulling our sleds were stoic; they seemed almost bored as Päivi tightened the brightly-coloured Sami harnesses around their stomachs. 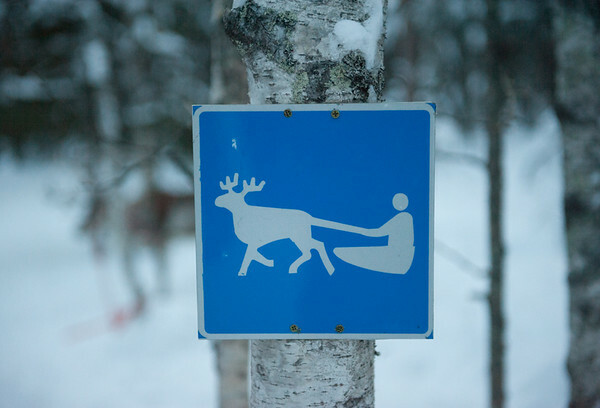 The reindeer are given a lot more guidance when sledding than dogs are. 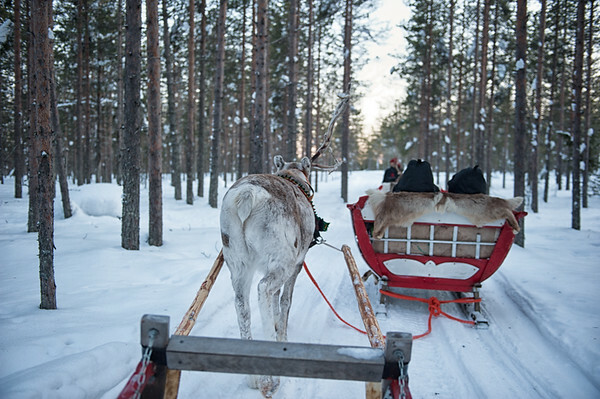 Each reindeer is loosely tied to the sled in front so they can never go too much off course. This really helps young bucks like the middle one in our pack, Hankakorva, who was yet to grow antlers and was still learning the ropes. Even though he was 4 years old, he wouldn’t be considered an adult and fully sled-trained for another year. Sledding through the woods behind Enska. My reindeer was the oldest of the group, a grizzled old veteran named Enska who couldn’t wait to drop his one antler. Every time we stopped, he scratched his head against any tree he could find as he tried to get rid of the itchy nuisance. My sled was nothing like a dogsled, which is a minimal contraption designed for speed. It was also nothing like the traditional Sami sled that I sat in during my trip to the reindeer farm in Rovaniemi. While that sled did have the same boat-like shape, it had a much stronger resemblance to a kayak — especially since it required a strong sense of balance to sit in (unless you wanted to risk falling face-first into the snow). Sitting in a more traditional (and slightly less balanced) sled in Inari. The nice thing about this sled was the fact that I could sit down and just enjoy the ride, rather than clinging on and constantly working the brake on a dogsled. The tall wooden sides of the sled may have kept out some of the wind, had we been going fast enough to feel any. As it was, I was wrapped in multiple reindeer skins (and the ubiquitous Arctic suit) to keep out the Arctic air. The only part of me that was consistently cold were my toes. Just like I’d been told, it was a very calming ride — possibly too calming for me, since my eyes were already drooping from a late night of northern lights watching! The landscape slowly turned blue as the long twilight set in and the reindeer’s bells rang in sync with their slow and steady footsteps. There certainly wouldn’t be any taking off and flying through the sky at that speed. Our campfire at the lean-to. 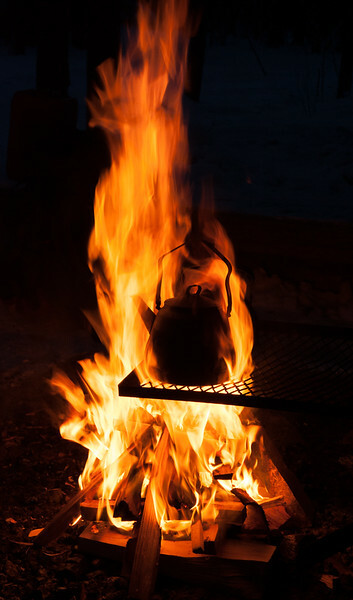 My favourite part of the trip was the break at a lean-to in the forest, where Päivi built a fire and served hot drinks. Much to our shock, she pulled off her boots after a few of us told us about our cold toes! She wasn’t trying to demonstrate how hardy she was as a native of Lapland; instead, she showed us that the quickest way to warm up cold feet was to take your boots off, warm your toes by the crackling fire, and then stick them back in the boots. Your body heat will then help warm up your boots. Just like the idea of wearing only one layer of thermals when sleeping in a tent in winter, doing this just seemed wrong…but it worked! I can’t say this is a road sign I’ve ever encountered before. She also told us of her love of the placid reindeer on her farm — reindeer that she never has to choose for slaughter because they are all sled trained. She had a particular affection for Hissu, the 11-year-old lead reindeer who was also the only one that had overcome his natural shyness enough to let us pat him. In contrast to how long it takes to train a reindeer, it doesn’t take very long to become qualified to drive one. 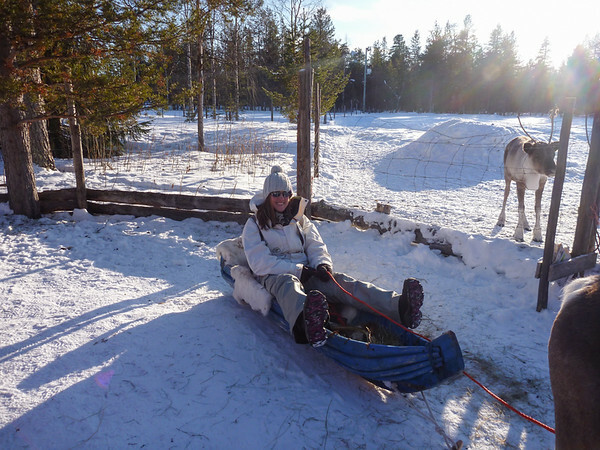 In fact, by the time we arrived back at the farm, Päivi was so confident in our driving abilities (albiet for a sled that was attached to the one in front) that we were all given our own international reindeer driving licenses! Now that will be useful back in Australia. 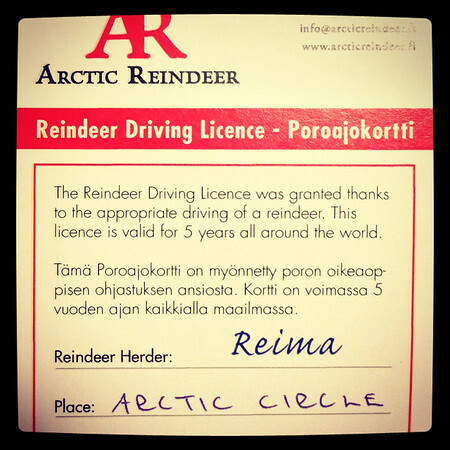 I’m an officially licensed reindeer driver! One thing we didn’t see on our northern lights tour were the northern lights. Since darkness didn’t fully fall until we were on our return trip to the farm, we didn’t get much of a chance to look for them; however, tours until February are operated under cover of darkness and have the opportunity to see the lights if they are high enough in the sky. I wasn’t disappointed though, having figured this would be the case from the tour’s starting time. And really, how could I be disappointed? After all, I’d been given a driver’s license without even having to show that I could parallel park my sled. My sledding trip was sponsored by Safartica, but all opinions stated here are my own. Safartica offer both winter and summer adventures that depart from Rovaniemi. Their winter trips range from visiting Santa to multi-day snowmobile trips. The ‘Reindeer Safari Under the Northern Lights’ tour operates on Tuesdays, Thursdays, and Saturdays, departing Rovaniemi at 6pm. It costs €113. What a cool expereince! How funny that the reindeer herders once used reindeer to sleigh them around on the chase. It’s a pretty entertaining thought, especially after sitting in one of those sleighs — they certainly take a lot of balance to sit in! I would have been buried in a snowdrift before too long. But I guess it worked for them, at least until the snowmobile came in and showed that things could be done a little faster! It was definitely an awesome experience Chanel! Reindeer are gorgeous animals. They’re lovely to be around…as long as you don’t get too close to their antlers (since they don’t seem to realise quite how big they are)!